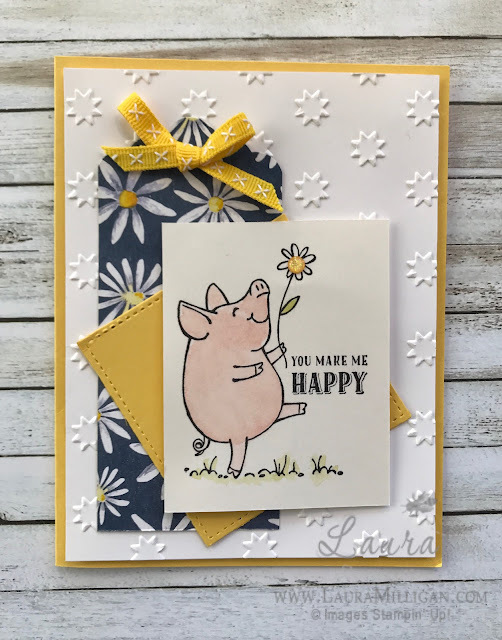 Welcome to the Stamper's Dozen May Blog Hop -this month we are sharing some projects that are Sneak Peek's of new catalog products! My card today uses the This Little Piggy stamp set- it is an adorable set!! To create this card, I started with a base of Daffodil Delight, and next a layer of Whisper White that I embossed with a new embossing folder called Oh My Stars. I used the lovely Delightful Daisy Designer Paper - the daisy pattern - to create a tag, and topped it with a bow, made with the new 1/4" Double Stitched Ribbon in Daffodil Delight. I cut a Daffodil Delight square from the Stitched Shape framelits to add a pop of color. My little pig was stamped with Archival Black ink onto Shimmery White cardstock. I used an aquapainter to add some color to the stamped images with Powder Pink and Old Olive ink. To finish the card, I added a small Glitter Enamel Dot - these are sparkly fun! Card Base - 51/2" x 8 1/2", scored at 4 1/4"
Whisper White - 4" x 5 1/4"
Daisy Tag - 2" x 4 1/2"
Shimmery White - 2 1/2" x 3"
Hope this card makes you excited for the release of our Annual Catalog and Idea Book! It goes live on June 1!!! I can hardly wait! There are so many amazing new products! But don't take my word for it - if you are from the US and don't have a demonstrator, and want to get your hands on a new catalog, just send me an email and I will see that you get one!! Thanks for hopping by today! This card makes me happy too. Love all the elements you put on the card. So sunny and pretty.